Mastrotto Group operates in compliance with the requirements set forth by the 96/98/EC framework with regards to the maritime fitting sector for EC ships. Blauer Engel, the German government certification, proves the ecological quality of the leathers produced by Mastrotto Group. Our leathers are produced with the purpose to minimize their impact on the health and the environment during the production phase as well as in the recycling and disposal phases. 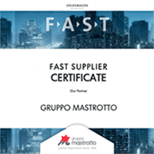 Mastrotto Group was given the Volkswagen FAST SUPPLIER award at the presence of the top managers of all the brands belonging to Volkswagen Group. Volkswagen Group officially agrees to have a privileged relation, a strategic and technologically more immediate dialogue with Mastrotto Group that, as its reliable partner, ensures excellent and profitable best practices able to follow clients in the innovation process and propose new development solutions in the meantime. Mastrotto Group is a key element of the strategy of Volkswagen Group with regards to leather, innovation and globalization, and is authorised to access confidential information not available to other suppliers with the purpose to boost the competitive advantage.